6 Strongarbh Park is situated in upper Tobermory, near play park and Golf Course. For more images, click here for our gallery page. Number 6 is a four bed roomed bungalow, with a sitting/dining room, a kitchen, bathroom with shower and a separate cloakroom. The sleeping accommodation comprises a double bedroom and three twin rooms. A cot is available on request. The kitchen is equipped with an electric hob and oven, a washing machine, a fridge, a kettle, a microwave and a toaster. The living room has a two seater and a three seater leather settee, a dining table set and a television and video/DVD. Each room has a heater. The house is set in its own gardens and has parking space for two cars. 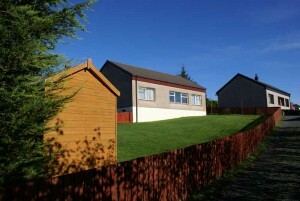 The house is located on the hill above Tobermory and is about a 10 minute walk to all the shops and restaurants. The golf course is very close by. £100 is required as a booking deposit with the balance due three weeks before the commencement of the let. On entering Tobermory turn right at the roundabout and travel down into the Main Street. On reaching the Back Brae turn left and travel about 100 metres up the road then take a sharp right turn, travel on to the Western Isles Hotel and turn sharp left into Western Road, continue along this road bearing to the right and then to the left. Strongarbh Park is the third road on the right just past the tennis courts (on the left-hand side of the road). Number 6 is the first house on the right up the gravel road. We would ask visitors not to arrive before 3pm and to vacate the house by 10am – this is to allow cleaning to be carried out.